Sheffield Steelers will be reacquainted with one of their oldest rivals in the new season as Manchester Storm were welcomed back to British Ice Hockey’s top league. The Storm, who will play at Silverblades Ice Rink Altrincham, were approached last week with a view towards taking up the slot in the Elite Ice Hockey League due to fears over Hull Stingrays’ future. It was confirmed today that Hull have been forced into liquidation and therefore Manchester have replaced them in all competitions. Steelers fans will be delighted to see the reemergence of the Manchester side, and will have fond memories of clashes in the late 90s at the then Nymex Arena which would draw crowds of up to 18,000. That Roses rivalry has never really been fully replicated, with Nottingham, Panthers picking up the mantle as Steelers biggest foes. 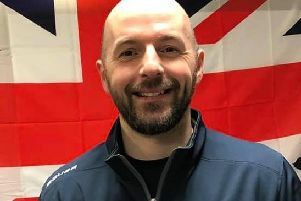 Mark Johnson, director of the Storm, said: “These are exciting times for ice hockey in the Manchester area and when we were approached by the EIHL to join the league, we pulled out all the stops to make it happen. Elite Ice Hockey League chairman Tony Smith alongside Mark Johnson, director of the Manchester Storm, at today's board meeting. Steelers Owner Tony Smith is looking forward to renewing rivalries with Storm, but speaking with his EIHL chairman’s hat on, he added: “We would like to officially welcome Manchester Storm to the Elite Ice Hockey League. “The name Manchester Storm is steeped in hockey tradition and it is great that it will once again be in the top flight of the sport. “On behalf of the league I would like to place on record the important contribution made by the Hull Stingrays Ice Hockey Club, both on and off the ice, to the growth and development of the EIHL. It remains to be seen where Manchester will take their players from however they are likely to have their pick of those being made redundant by the folding of the Stingrays.